The garlicy smell coming out of my amma’s kitchen and am jumping down the stairs of my home peeping into kitchen to see my paati(grandma)grinding the roasted masala with garlic for rasam.Usually whenever there is a heavy lunch during sunday afternoons this one rasam is a compulsory item to complete a very satisfying meal.Actually there is another time that they make this poondu milagu rasam!for the treatment of colds and coughs which gives an excellent relief from the starvings. 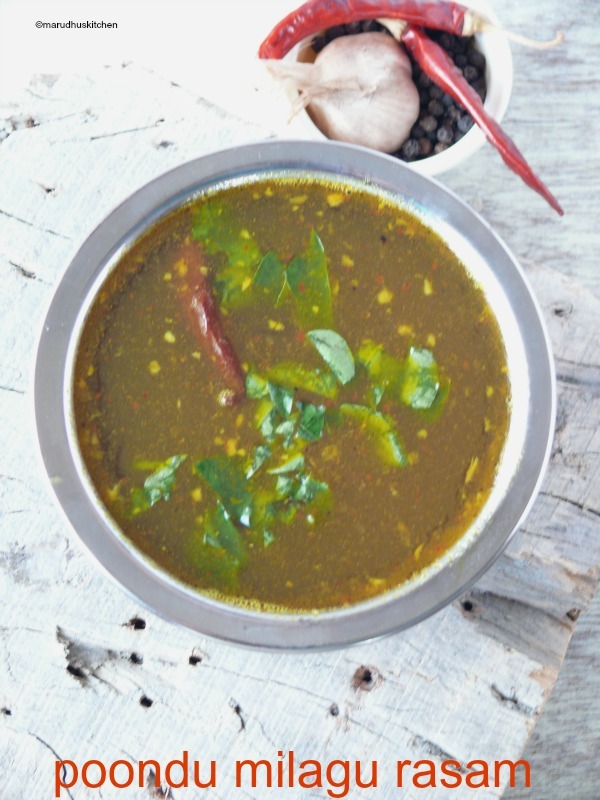 It is during these peaky days we use to do this rasam have it with hot rice it feels so comforting and a handy relief. At my mothers space the rasam will always be spicy as my father likes it to be!but here both my hubby ,in-laws and children are less spice loving people so I prepare it less spicy.The specialty of this poondu milagu rasam is that there is no need to add tomatoes!the addition of pepper and garlic does all the magic.Roasting the masalas will release all the flavours which is more important for this poondi milagu rasam/pepper garlic rasam.Don’t over boil the rasam as the rasam taste will be totally spoiled. 1.First soak tamarind and take extract dilute with water check for tanginess. 2.Dry roast the “rasam powder” ingredients and finally grind with garlic in it and keep ready. 3.Keep a kadai add ghee add mustard,redchillies and asafoetida and when seeds splutter add powder mix and add tamarind extract. 4.Add salt, turmeric powder,curry leaves. 5.Let white foam form with a light bubble boil. 6.Switch off and serve with hot rice and appalam. 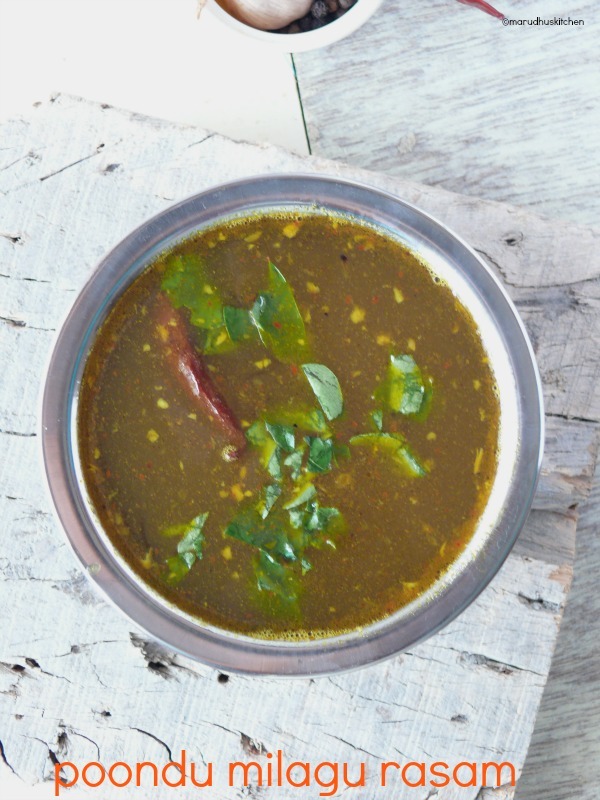 Talk about Mother’s love oozing out of her dishes and this garlic pepper Rasam is a perfect example. Vani how beautiful were those days when the aroma from the kitchen would draw us into the kitchen with such heart warming sights of moms and grand moms busy with their labour of love. I am so happy that you are carrying on your Mom’s traditions through these delectable recipes and much much more. The Rasam looks very appetizing and for me garlic and pepper is a combination which works wonders on my taste buds. I love this Rasam like I love all your dishes which are laced with tradition, love and creates magic with every bite. As always the clicks are simply outstanding. Can’t wait to try this out. Lovely recipe! All time favourite and soothing rasam!! Perfect for any season! !